This dinky little desktop is even shorter top-to-bottom than the Chillblast Fusion Crossbow, but don’t be fooled: the key internals are no less competitive. Besides the not-at-all-surprising-at-this-point GTX 1050 Ti graphics card, Wired2Fire has included the quad-core Ryzen 3 1200 and gone a step further by overclocking it up to 3.7GHz. 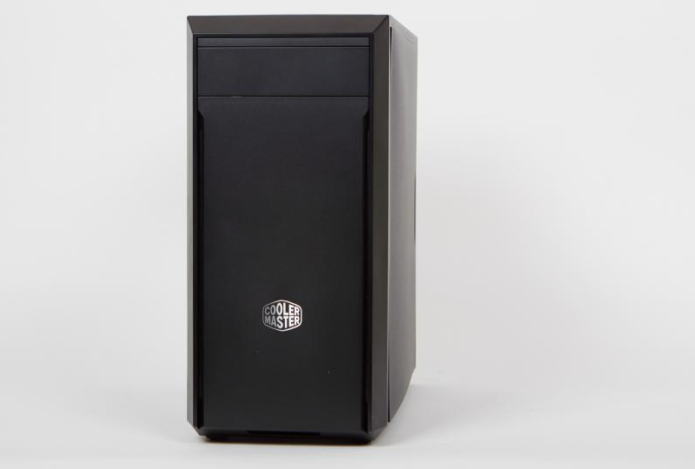 Despite this clever touch, because the Cooler Master Masterbox Lite 3 case mounts the PSU at the top, without a shroud, this PC has more of an overtly “budget” look than the others. Exacerbating things are the plain black styling and the numerous cables at the bottom, visible through the small plastic side window. Still, this is a gaming PC, not a fashion accessory, and on those grounds it does well. Its 74fps in Dirt Showdown, running on the usual Ultra preset, is very much on a par with the other similarly specced PCs. In Metro: Last Light Redux, it falls just short of our recommended 30fps on Very High quality, although its average of 28fps wasn’t too far off by any means. Getting it to a smoother, more easily playable standard was easy, with a quick drop to Medium quality (and turning off both tessellation and advanced PhysX effects) yielding a slick 64fps. VR capability is so-so, judging by the score of 3.0 in the SteamVR Performance Test, but as with all PCs landing in the 2.5 to 3.5 range, that’s good enough to run most VR games without having to make excessive cuts to visual quality. Switching to our CPU-focused 4K tests, the Pyro Stryker scored highly, ending with 105 in the image test, 108 in the video test and 105 in the multitasking test. This produced an overall score of 106, which puts the overclocked Ryzen 3 1200 very slightly ahead of its replacement Ryzen 3 2200G when the latter is running at stock speeds. True, the Palicomp i3 Pulsar and Mesh Ryzen Gaming PC – CS both come out ahead in a direct comparison – these are powered by an Intel Core i3-8100 and a Ryzen 51600 respectively – but we admire the Pyro Stryker’s otherwise successful attempt to make up for its modest stock performance with overclocking trickery. A clock speed of 3.7GHz isn’t even the highest a Ryzen 31200 can go, either, but perhaps it was wise not to aim for something like 3.9GHz or 4.0GHz, considering that the chip is only being cooled by a basic Wraith Spire air cooler. For the record, however, you can tinker with the core multiplier yourself, should you so wish; the microATX motherboard’s B350M chipset does allow it. What this board doesn’t allow much of is physical upgradability, as there’s no room for a second PCI-E x16 slot, and one of the two PCI-E x1 slots is obscured by the GPU. On the other hand, there are a couple of positive points for a motherboard of this size: instead of just two RAM slots, you get four, and three of these can be added to without having to toss out an existing stick of DDR4. There’s also an M.2 slot, for an NVMe SSD or Intel Optane Memory drive. The latter in particular might be a wise purchase in the future, as the Pyro Stryker comes with only a 1TB hard disk. Adding a cache would, therefore, be an easier and more cost­ effective way of giving this mechanical drive a speed boost than buying an SSD and moving your entire Windows installation to it, although to be fair, the hard disk posted some relatively fast file-transfer speeds in AS SSD, with a sequential read speed of 190.14MB/s and a sequential write speed of 158.27MB/s. Using the M.2 slot would also help deal with the Masterbox Lite 3’s minimal drive capacity: it has just one dedicated 3.5in and 2.5in tray apiece, and the latter is awkwardly placed underneath the former, so installing an SSD is much fiddlier than usual. The good news is that there’s also a 5.25in drive bay, something that’s either been forgotten about or wilfully ignored on many modern chassis designs. This can also hold one extra 3.5in drive or two 2.5in drives, pushing the theoretical maximum up to a half-decent four, although ideally this wouldn’t require sacrificing the ability to have a front-accessible optical drive. As simple as it is in some respects, it would be unfair to characterise this is an utterly basic budget case. The two USB ports on top, for instance, use the faster USB 3 standard, rather than USB 2, and we like that there’s a magnetically attached dust filter behind the front panel. It’s easy to remove, and thus easy to scrub regularly. The motherboard also deserves credit for its rear I/O panel, which ditches USB 2 entirely for a mix of four USB 3 ports and two USB 3.1 ports. That’s on top of two PS/2 connectors, 3.5mm audio jacks and an Ethernet socket, plus one HDMI port, one DisplayPort output and one DVI-D socket. All things considered, the Pyro Stryker’s pre-overclocked CPU is about the closest it comes to standing out; it performs well across the board, but it doesn’t have the best performance, the best storage or the best design, nor an exceptional combination of any of these factors. That makes it difficult to advocate over the Mesh Ryzen Gaming PC – CS or Palicomp i3 Pulsar, but at least this PC doesn’t have any serious weaknesses either.